I wanted to believe in Professor Marston and the Wonder Women, even though I know little of the filmmaker, roll my eyes at the title, and tend to be disappointed by fictionalizations in biopics, which are, of course, often full of heightened drama and good people turned into villains, etc. 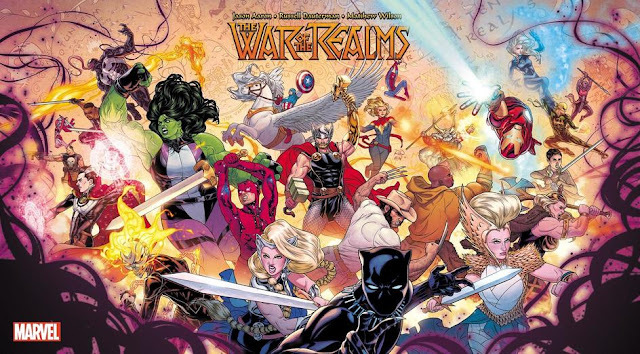 A woman of color taking an explicitly queer look at a family who changed comics? I want that to be good, not only to have good intentions, and quality production, but to get it right. The more I saw Christie Marston express concern, frustration, and disdain, the more nervous I got. Because, I’d gotten it wrong, at times, too. I totally accepted that, for instance, Olive Byrne Richard and Elizabeth Marston were lovers, in addition to being romantically/sexually involved with William Marston. I’d seen it discussed in print, I had heard it from trusted acquaintances more in the know that I was. And, it seemed agreeable to me. It was, when you look how long they were connected and their lives, adorable. I like amazing couples, and even without William Marston’s living presence, Byrne and Marston were an amazing couple. Except, they weren’t, because it was not that kind of relationship. So, what was it? What was going on, back then, and with this movie, right now? If I couldn’t rely on academics, comics critics, or writers and artists who’ve seen the depths of the DC archives, who am I going to turn to? Christie Marston, of course, the woman who started me worrying about the picture in the first place, and whose forthrightness has inspired me to steer a clearer path since becoming acquainted with her. This interview is, in the interest of full disclosure, compiled from waves of question and answer, conducted through private channels. I have rearranged the order of some answers, but kept her statements intact as much as possible. I have not injected any new questions or speculation beyond what you have already read above, though I have reworded myself, for clarity’s sake. Travis Hedge Coke: Are you looking at Professor Marston and the Wonder Women with any kind of optimism? Christie Marston: No, I have been looking on with dread. Nobody had ever been in touch with the family to research and gather facts, which was a strong indicator that it was likely to be far from reality. 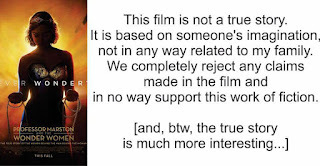 HC: The title of the movie bothers me. Maybe it shouldn’t, but even a cursory googling shows that Elizabeth Marston were on their own, very very accomplished. “Professor Marston and the Wonder Women,” to me, reads like, “Professor Marston and… um, some women.” Am I reaching? M: LOL! No, I'm with you on that, but the reason for it is to use Wonder Woman's name in the title. 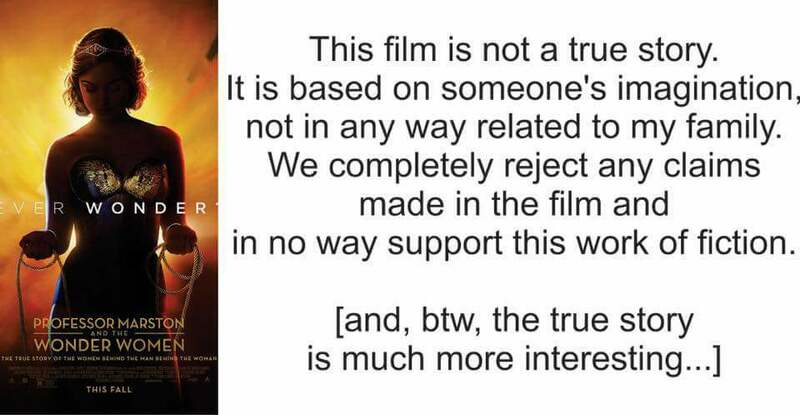 HC: What kind of negative effects do you believe can come of inaccuracies represented in the film? M: Both the relationships portrayed and the story of Wonder Woman's 'origin' are sheer fantasy. What people think about the relationships is pretty incidental. But Wonder Woman came about primarily because of Gram (EHM), and in the film she is doubting and negative. The truth is very much the opposite. My grandfather was hired as a psych consultant to help ease comic books into the mainstream. Charlie Gaines suggested (somewhat jokingly) to WMM that he write a comic book. He went home and discussed it with Gram; she said to go ahead and do it, but that the hero needed to be a woman. The real origin of Wonder Woman should not be obscured! HC: Where would you suggest people go for the truth about Wonder Woman and about your family? Any particular books, websites, or museums? M: The best book is Travis Langley's Psychology of Wonder Woman. Tim Hanley did a good job of researching his book; we disagree on a few things but he worked very hard to stick to reality. The Lepore book is pure poison. The Daniels book is pretty, but none too accurate. M: It is popular belief that WMM sired Dotsie's (OBR) children. I will not address that; that story belongs to Dots' side of the family. However, the kids were adopted by WMM and EHM to protect them from societal pressure, so they ARE his kids! Gram and Dots were as sisters. HC: Are your branch and the Olive Byrne Richard branch of the family still close? HC: For clarification, is Richard, in Olive Byrne Richard, an adopted surname? M: Yes. She added that at some point around her first son's birth, and kept it. We all tended to shorthand names (WMM, EHM, MM) and I forget that strangers often refer to her as just Olive Byrne. She was OBR. HC: I am amazed by Elizabeth Marston and Olive Byrne Richard, but there is so much speculation when it comes to Wonder Woman. How involved were they in the creation of the character and world, but also, in the serialized Wonder Woman stories? HC: What was childhood/family life like? Did you, or any of your family, experience any bullying or difficulty because of public stemming from your grandparents life or work? M: When I was a kid, the Wonder Woman comic was barely known. It had changed drastically after WMM's death in 1947. Few friends even knew the connection; it just wasn't something that would ever have come up in conversation. The tales of the personal relationships were not hatched until the Les Daniels book was published. I can safely say, however, that I would have set straight any bullies on that or any subject!! HC: That is the best answer! M: Well, yeah...there was no bullying anywhere near me in school - if i saw somebody doing that to somebody, I put a stop to it. And made clear that I'd best not hear that it ever happened again. LOL. HC: Is there any positive value, that you can see, in doing a “true life” movie about your family that is largely fictionalized for effect? M: No, I see no value in doing a fictionalized movie about this family or any - I have an enormous respect for truth. There is, however, a positive value in doing a true movie or series about the family and Wonder Woman. The real people (and the generations that produced them) were interesting and very much open minded forward thinkers. They did not conform to silly societal norms; they simply worked around them. Like Wonder Woman, they can help people to open their minds, and to stay strong in being true to themselves and others. HC: Given that the filmmaker wants to promote this as a feminist and queer-positive movie, what would you rather she have focused on, in terms of your family? M: As far as involving the Marstons in a feminist and queer-positive movie, that would have been easy! All involved very very much pro-choice in all matters. The respect for women went back generations, so the feminist thing was already part of everybody's psyche. There was a lesbian who was very much part of the family who could have been included. The TRUE story would have been SO much better...and true!! HC: Would you be open to working with a filmmaker on a movie about your grandparents, if they involved family in the vetting process? M: At this very moment in time, there is a project being pitched which I will endorse if it comes to fruition. It comes from many, many years of very extensive research by a woman of integrity. Over the years of research we have become good friends, and I trust her. I have answered countless (countless!!! That woman wants to know every detail of both facts and personalities!) questions over the years, and will certainly continue to do so. She really does know the people involved, even though she never actually met them. I really hope that this happens. The true story is actually pretty fascinating!